Michael has spent more than twenty years in the media industry working on entertainment shows, a children’s novel, and ‘Warren Utd’, an animation coming soon to ITV. But creating original and innovative art is his true passion. In recent years, Michael have moved into more ambitious work – digitally manipulating his photographs to produce unusual works of art and installations using a variety of material and surfaces, including neon, L.E.Ds, brushed aluminium, and unique ‘colour changing inks. His latest collection celebrates the beauty of the city through the shapes and outlines that define its landmarks and character. Recent exhibitions include the Affordable Art Fair in Battersea, the New Artist Fair at the Candid Arts Galleries, and the Open Studios Art Show (here at Wimbledon Art Studios). You can see the neon installation of Battersea Power Station at Hicks Gallery in Wimbledon. 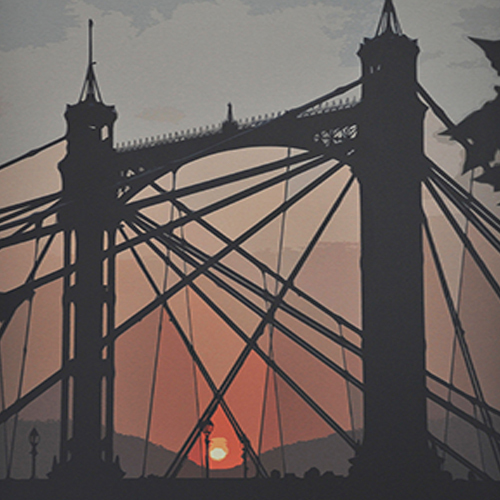 Four prints will also feature in the upcoming ITV drama ‘The 7.39’. Feel free to visit Michael's studio anytime. Commissions are welcome too.